Pre and Post massage skin cleanser. Ideal wherever fresh water is unavailable and a spirit base is required to lightly cleanse the skin. Efficiently removes oil from skin following an oil based massage. Prevents oil residue absorbing into clothing following massage. Light refreshing aroma. Very refreshing when used in warm weather sports. Can also be used to cleanse work surfaces of excess oil. Supplied in re-sealable 500ml bottle. Our Wash Cloth Mitts are the ideal product to simply wipe and cleanse the skin using the cologne. An ideal companion to the therapeutic oil - I've used both for over 10 years. 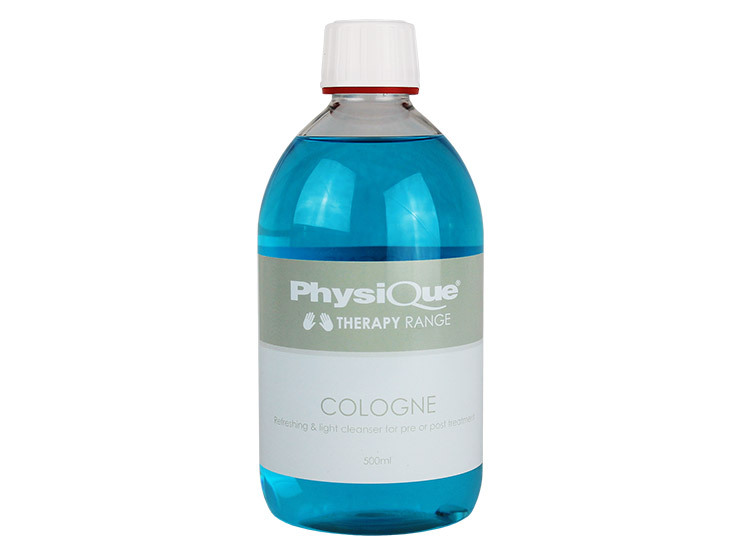 The cologne effectively removes oily residues and leaves a pleasant, fresh aroma. Clients appreciate use of this cleaner and I've never had an adverse reaction. An excellent product with multiple uses in clinic. Useful for cleaning skin prior to taping and strapping, removing oil during treatment to allow for friction techniques and at the end of treatment to avoid damaging clothes. Perfect to use when cleaning treatment plinths and equipment. In its primary use as a skin cleanser, pre massage it not only prepares the skin removing that little bit dirty most people have and that always rolls up during massage but it is a good basis to start a good massage. Post treatment it is excellent at removing product from the skin and give the client that "clean" feeling after their treatment. Without it the client has that sticky feeling massage mediums leave behind. With the client it also compliments taping as it can remove natural oils found on the body that can hinder effective tape application. It is a must have for any therapist!! and it also smells great! Aside from the usual applications this product is great to clean couches, bolsters, tables and bottles getting them free from oil. It is also great for out of in the field for cleaning your hands in those "oh no i forgot hand cleaner/sanitiser" situations. And finally I will be honest - it is fantastic for degreasing delicate machinery (i'm a sport shooter, its fantastic on my gun!) and it leaves no residue! !